Jesus said: "Amen, amen, I say to you, whoever does not enter a sheepfold through the gate but climbs over elsewhere is a thief and a robber. But whoever enters through the gate is the shepherd of the sheep. The gatekeeper opens it for him, and the sheep hear his voice, as the shepherd calls his own sheep by name and leads them out. When he has driven out all his own, he walks ahead of them, and the sheep follow him, because they recognize his voice. But they will not follow a stranger; they will run away from him, because they do not recognize the voice of strangers," Although Jesus used this figure of speech, the Pharisees did not realize what he was trying to tell them. So Jesus said again, "Amen, amen, I say to you , I am the gate for the sheep. All who came before me are thieves and robbers, but the sheep did not listen to them. I am the gate. Whoever enters through me will be saved, and will come in and go out and find pasture. A thief comes only to steal and slaughter and destroy; I came so that they might have life and have it more abundantly." This past Wednesday was April 13, which marked the 262nd birthday of Thomas Jefferson, one of Virginia's most famous sons. Jefferson made significant contributions to the American experiment - his ideas on democracy and religious freedom are noteworthy and foundational to the freedoms that we enjoy in this country today. Our nation's third president, however, was a deist. What's a deist? A deist is someone who believes in God but does not believe that God plays any role in the affairs of man past the moment of the creation of the universe. In order words, God can be compared to the giant clockmaker in the sky who fashions a clock, winds it up and sets it into motion. He places the clock down and lets it go. God neither communicates grace into the world nor is He an active agent in human affairs. The logical conclusion of all of this is the idea of the rugged individual or self-made man. Since there is no grace in the world, man has to rely on his own powers to do good. Any success that he experiences in the world is self-generated. These ideas stand in direct opposition to the Catholic understanding of God's role in the world and our participation in His life. Catholics believe in grace - that God assists us in various ways throughout our lives. Catholics also believe that we are not self-made men. Rather, any good that we do is a participation in God's goodness. Yes, we do good things but we don't do good things merely on our own. Rather, God's grace is active in the world and it is His grace that ultimately empowers our good works. So, when we consider the image of the Good shepherd, as it is presented to us in today's Gospel, we see how this is played out. 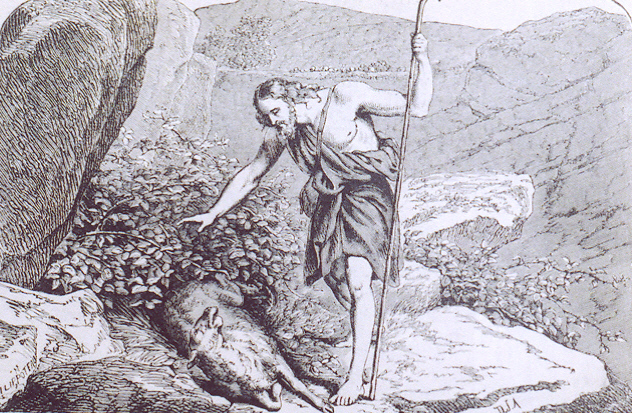 In the image of the Good Shepherd, this had a particularly strong meaning for the Jews. In Ezekiel 24, the prophet foretells that the Messiah will be a good shepherd who will lead the flock of the House of Israel to pastures of freedom and glory. So, when Christ uses this image, He indicated that HE is that Good Shepherd. If we held for Jefferson's line of thought, then the image of the Good Shepherd model falls flat on its face. After all, the image assumes that the shepherd is active among his sheep. This is in fact the case. On the local level, all the way up to the Pope, you have living examples of how this works: "You have a pastor and his associate. The word "pastor" means shepherd. The pastor is in charge of all of the parish decisions and he answers to our local chief shepherd, the bishop. The bishop, in turn, answers directly to the Pope. As shepherds, your priests and bishop are ordained to guide, direct and lead. We are ordained to preach the word of God and administer the sacraments - the two normative ways in which the people of God are nourished. Liturgically-speaking, see how this is played out in the posture of the priest at Mass. For example, it is perfectly legitimate for the priest to offer Mass facing the crucifix. Why would he do this? The priest, acting in the person of Christ, imitates a shepherd leading his sheep by walking in front of them. He does not act like tour guides who face their sheep while walking backwards. Many persons remember the days when priests would offer the Mass facing the crucifix and they will say, "Father, those were the days when the priest had his back turned to us." That statement assumes, of course, that the PEOPLE are the point-of-reference in the Mass. We know that this is not true. GOD is the point-of-reference in the Mass and so when the priest said Mass facing the crucifix, he only had his back to the people by default. He wasn't trying to shun or hide something from the people. Rather, he was standing as a shepherd would stand leading his flock forward from the world, represented by the pews, into heaven, represented by the sanctuary. Meanwhile, the sheep have a different role to play. They are charged with listening and obeying their shepherds. Even the image of the sheep itself is very instructive. Sheep are very messy animals and they tend to wander here and there. And yet, sheep are docile, pliable and open to being guided by the shepherd's staff. That is why the bishop carries a staff, called a crozier. The crozier has a crook at the end and this was used by shepherds to gather the sheep back into the fold if they strayed. The sheep's docility, however, runs in direct opposition to the idea of rugged individualism. Docility is not considered a virtue among Americans. And yet, Jesus tells us that in order to be sheep that can be lead to pastures of everlasting life, we must learn to be docile to our shepherds. And yet, we find many people who claim the Catholic faith and say, "I love Christ but I don't agree with what the Church teaches." This is an oxymoron. One cannot love the Bridegroom without loving the Bride. This is called Cafeteria Catholicism - pseudo-Catholicism that picks and chooses doctrines that the individual likes. A liturgical example better illustrates this point: When one approaches for Holy Communion and says, "Amen," one is saying, "so be it," to a number of propositions: to the real presence of Christ; to the priesthood that confected our Lord; to the bishop who ordained that priest; to the Pope who keeps the bishops in communion; and to the entire body of doctrine that Catholics as a believing community hold. If one approaches for Holy Communion and does not believe all that the Church teaches then their "Amen" is a lie - it is disingenuous. Such a person should not receive Holy Communion until their dissent is resolved. One may struggle with a teaching but one may never reject it or fail to give full assent of the mind and will towards it. So, while Christ wishes for all of us to be saved, not all will be saved. This is not because of Christ or the teachings of the Church He founded, but because of the hardness of heart of those who won't listen to the shepherds. Instead, they prefer to live in the darkness of moral subjectivity, inventing truth as it is convenient to them. In a few hours, the conclave will begin to elect our next chief shepherd, the Vicar of Christ - His visible representative on earth. Let us pray for the grace to listen to his voice so that we may be lead to the pastures of everlasting life where the grass is always greener and where the Good Shepherd, the Lord Jesus Christ, awaits those who are like docile sheep - faithful to the end.